There are 3 ferry routes operating between Incheon and China offering you combined total of 7 sailings per week. LYG Ferry operates 1 route, Incheon to Lianyungang which runs 2 times weekly. Dain Ferry operates 1 route, Incheon to Dalian which runs 3 times weekly. Yingkou Ferry operates 1 route, Incheon to Yingkou which runs 2 times weekly. As the frequency and duration of crossings on some routes varies we would advise that you do a live search for crossings from Incheon to China to get the most up to date information. China is a massive country in East Asia, and the most populous on the planet, spanning over nine and a half million square-kilometres. Known the world over for its sumptuous cuisine, historic landmarks and animated New Year celebrations, China has an intensely rich cultural heritage, accommodating almost a hundred million visitors each year. 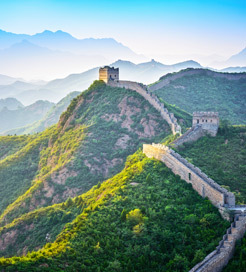 Many millenniums of inhabitation have culminated in some of the most recognisable monuments on earth: the Great Wall of China, the Forbidden City Palace of Beijing and the Terracotta Army sculptures. While the capital, Beijing, and largest city, Shanghai, are skyscraper-clad testaments to the nation’s progressive and ultra-modern outlook. The frequent and high-speed ferry services make it easy to reach to China from the Special Administrative Regions of Macau and Hong Kong, with multiple crossings every day lasting no longer than an hour. 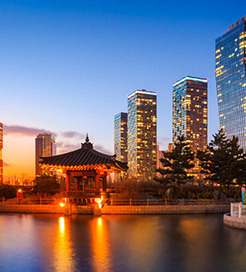 For international services, long-haul sailings from South Korea and Japan are also available.